I've been looking for a Spark Arrestor for my 4" engine, which happens to be 115mm at the chimney top, tapering down. What I was after is a Balloon style guard, but the prices seemed a little on the expensive side starting at £65 plus. But when I refurbished my roof many moons ago I used wire made balloon style bird cage guards to protect the chimney pots, why can I not use these? So I am waiting for an order to arrive for a Wire Balloon Gutter Guard in Stainless Steel, but also available in Galvanised Steel, price £7.91 posted to me. Once it arrives I'll let you know how successful it looks, but if you want a look on line it's www.wireballoons.co.uk. But to me it looks OK, let me risk my money first though and I'll post a photo and let you decide? Mick at the wiston ralley had made one out of a bird feeder which I thought was quite nice. The leaf guard arrived, specifically designed to stick down the outlet pipe of a gutter, stainless steel and has three sprung legs that grip the pipe, £7.91. I like the look of it, OK it's not going to catch a huge amount of sparks but I wanted the thing cosmetically as I think finer mesh will probably clog right up. Any way you be the judges. 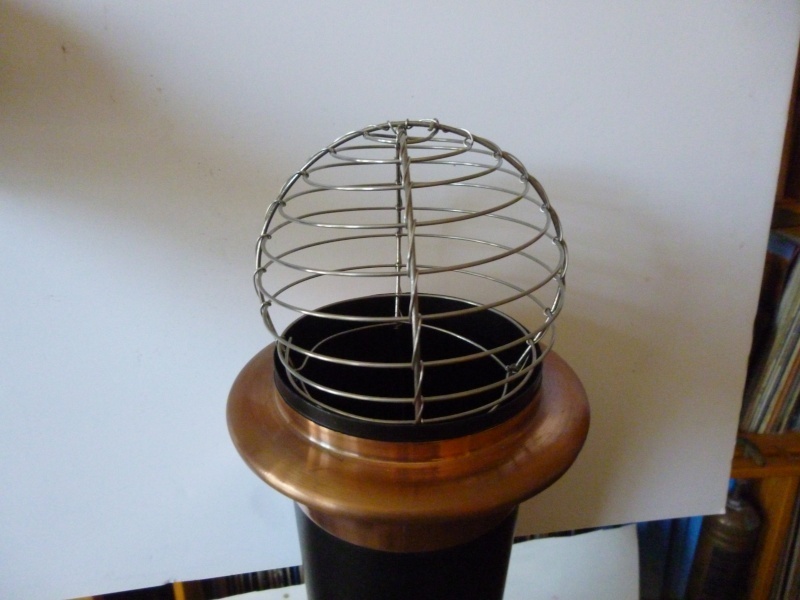 They are available in a number of inexpensive sizes, stainless steel or galvanised, www.wireballoons.co.uk.